When the weather turns cold, wet, rainy or frosty, many of us crawl under a warm blanket and resign ourselves to a season of inside fun. Our Washington Conservation Corps crew, on the other hand, gets ready to work outside and get the job done! Here are some photos from some of their first outings around Snohomish County including some plant maintenance and live stake cutting for use in propagating trees. Back on November 10, Snohomish Conservation District, along with 10 other districts took part in the first Puget Sound Orca Recovery Day. Our WCC crew prepped the area along Woods Creek to make it easier for the volunteers to plant the plants. 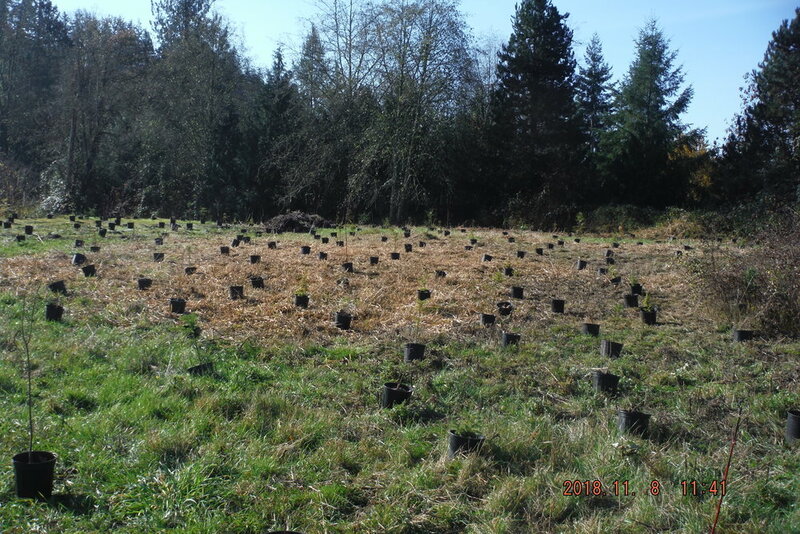 Fun Fact - The property planted on Orca Recovery Day was the last parcel within lower Woods Creek in Monroe to be planted with a riparian buffer. There is now about 4,285 linear feet of connected riparian buffer along Woods Creek, spanning across 9 parcels! Photo is of the site's condition before maintenance. Our crew paired up with SCD IP member to stage around 250 potted plants and clean up the surrounding area, so future volunteers could efficiently plant the site. Photo is of the site's condition during maintenance. Our goal was to clear as much space as possible by brush cutting reed canary grass and Himalayan blackberry. Showcasing Pileated Woodpecker present at site. Photo taken after all maintenance was completed and all plants staged. Both Deciduous and Coniferous species were spaced out to create diversity. Volunteers planted all this vegetation at a later date. Photo taken after all maintenance was completed and all plants staged. From left to right: Bethany, Devin, Julia, Carson, Danielle. Photo Credit goes to Kelli Sheldon. 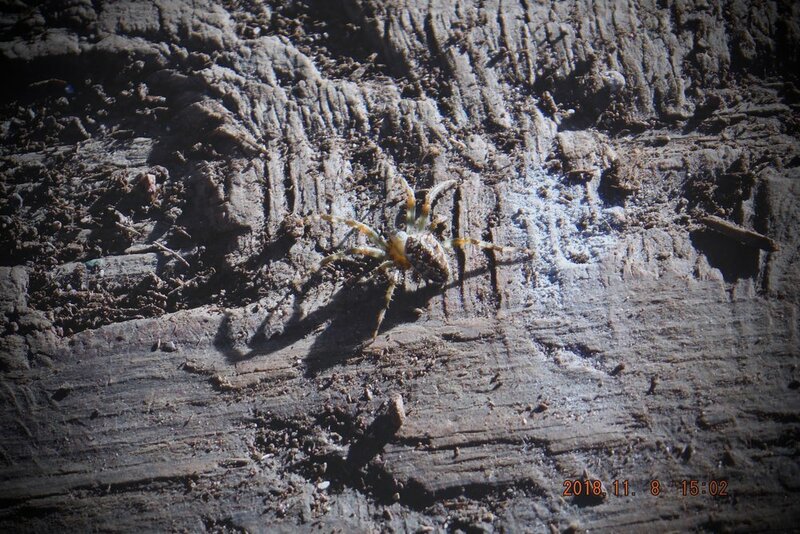 Cool spider found on table at our native plant nursery. Crew taking sleds, rain gear, walking sticks, and loppers to the site where we stored our live stakes. Goal was to trim live stakes, load them in sled, and plant them all across the wetlands. If successful, these willows will eventually out-shade Reed Canary Grass and help keep water temperature ideal for wildlife. On boardwalk after all crew members loaded up sleds with live stakes. Took them out into the grass to establish them across the property. Bridge crossing small creek. Large salmon making its way up the stream. Very cold morning! Crew taking out gear to site in order to load up more live stakes. This time we took a metal bridge to cross in-between channels and over deeper streams. SCD Crew cutting live stakes to promote new growth and loading in their sleds to plant around site. To the right, various tree and shrub species are packaged in bags. We leave them resting in the water until we need them for planting. Cold morning where sunlight hadn't hit all areas of the pond, leaving the Reed Canary Grass covered in frost. Small segment where live stakes have been established in the wetlands. Various water depths visible here.